The white gold glow of the setting sun is shining through the living room window bathing the plant corner in warm light – the now tall blue/green cactus and soft green spider plants have not felt this angle of the sun in a long while; I imagine, looking at them that they are as happy as I am taking in this peaceful moment. As the sky erupts in a pink swathe, this time and place, a few stolen minutes, remind me to slow down from the busy day, taking the time to drink in the promise of spring. With only 8 dry days out of the past 62, spring seems to have cloaked herself in gloom and endless tears refusing to let go of winter’s cold hand. The bare trees can no longer wait for this romance to end and have begun to unfurl their new leaves despite the rain, knowing that summer is impatiently waiting in the wings painting her lips in all manner of vibrant colours! Our favourite forest trail was opened briefly for the recent holiday festivities and I managed to walk its cool depths twice, inhaling the sweet scent of cedar and wet earth with the sound of the ravens echoing above, this time and place a balm for a restless soul. To walk beneath the heavenly warmth of filtered sunlight was an added joy and the wait for this special trail to be opened again for the summer will seem long to one who drinks in the peace of this place as a thirsty man might do when coming upon water. 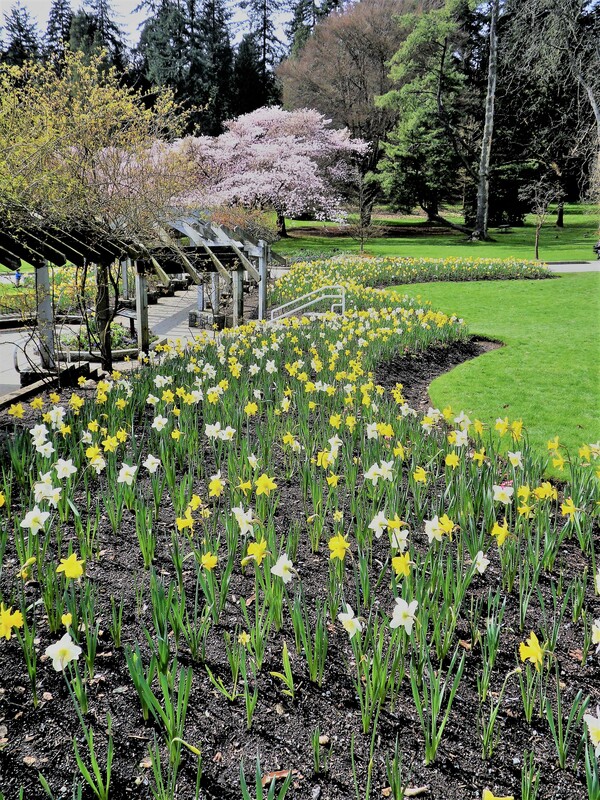 Spring has sprung at the Rose Garden in Stanley Park (Vancouver, B.C. ), we often walk this way to our favourite forest trail near the Railway Cafe! 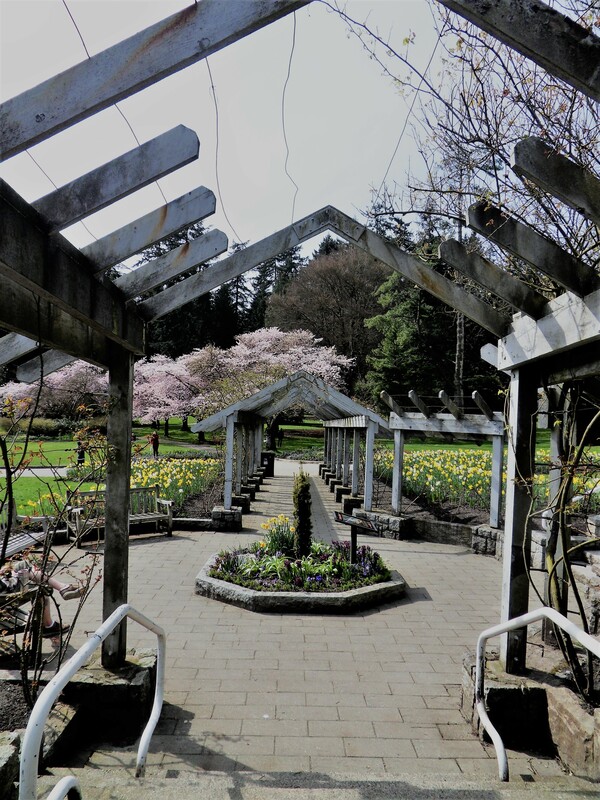 Another spring view showcasing the beautiful cherry blossom trees in bloom at the Rose Garden in Stanley Park (Vancouver, B.C.). In my neighbourhood the construction zones are creeping ever closer, leaving empty lots and storefronts in their wake – as I sit at my desk in my aerie overlooking stunning natural beauty, I’m reminded that this particular time and place is about the wild places close to my heart, the lone African drummer on top of the hill overlooking the seawall, the scent of wet green grass, not about any sum of money to be had or made. 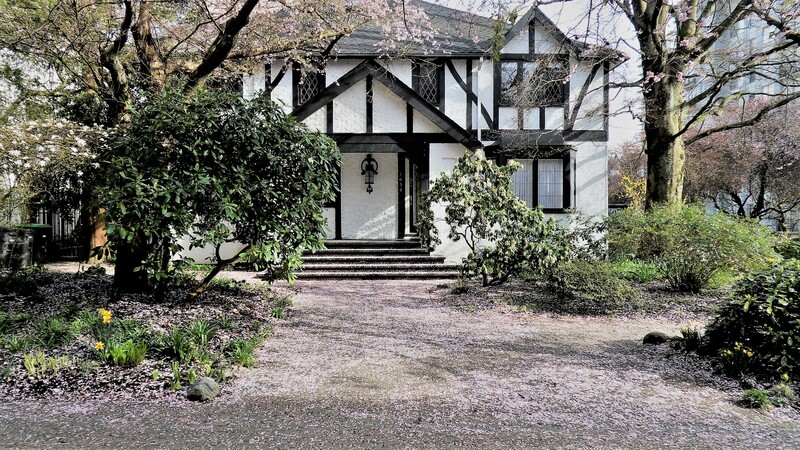 I often sit near this beautiful home nestled among the towers of the West End to journal write in the parklet there (Vancouver, B.C.). 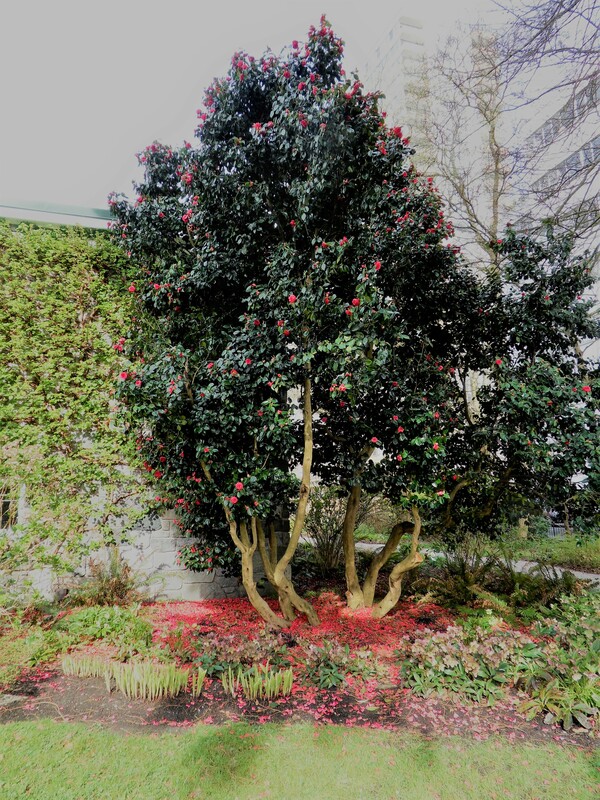 A beautiful camellia shrub standing among its fallen petals (Vancouver, B.C.). This entry was posted in blog, journaling, life, memoir, travel and tagged beloved, change, city, forest, longing, ocean, peace, place, seasons, Spring, sunset, time, travel, Vancouver, warmth, wild. Bookmark the permalink. Wonderful imagery, I close my eyes and it’s as if I’m there experiencing first hand. Sad to hear about the recent developments: hate to say it but it’s happening over here as well. Sometimes private corporations feel that modernizing a rural area will make it more appealing when actually it just benefiting their pockets with $$$. Thanks for sharing! You’ve warmed this writer’s heart with your words, I’m glad my words brought you into my world for a brief moment or two! This “truly” warms the heart, a writer hopes to read words such as these and it’s a joy to find them here, thank you (always!) from the bottom of my heart! Wow Kim, your words never cease to amaze me. You are a real writer and a poet. Love the way you describe the awakening of spring.” waiting in the wings painting her lips etc” .love it. On the other hand, how scary what is happening now . How long can we still stay in Vancouver? What is the future? So many gready landlords. Our paradise is tarnished for sure. Thanks again for this lovely note. I always enjoy reading you. Big hug. Huguette❤️😘 Thanks Terry for the photos he shared with you. This first sentence resonates in me like no other, Kimberlee. I didn’t realize how much I loved Finland until I left it for Denmark, almost two years ago… oh how I missed it there! I’m so glad you enjoyed the read, Samuel and I love to see your words here, it makes my day! I’ll pop over and catch up on your beautiful blog soon! Thank you, Samuel, I feel the same – it’s hard to catch up on so many things at the moment but I’m hopeful…I’m glad you enjoy your visits here…I’ll see you on the other side soon! You’re ability to use the written language is so distinct and profound that I can literally feel myself gazing through exactly the places you are describing. .and one thing I really like about your work is you never lose that tinge of poetry in every post..the opening quote is always beautiful and appreciate as well..
With such beautiful words to read, I’m glad that you found me! Thank you for stopping by, it’s always a pleasure to read your comments, they inspire me to keep on writing! Thank you so much for including my post in your awesome “Posts of Note”segment, I’m beyond thrilled! What a lovely comment! It warms my heart and thank you from the bottom of this same heart for the share! Such a beautiful and poignant post Kim. The joy of spring against the awful destruction by developers. I love the cherry blossom in your beautiful park. I am going to Amsterdam soon and hope to see some amazing bulbs plus some cherry blossom. Thank you once again for your very kind words! I hope you have a wonderful trip and get to see the beautiful tulips as well as some cherry blossoms…it’s been a long while since I visited Holland as a child, I remember the ladies washing their stone steps with sudsy water each morning…have fun, I’ll be thinking of you! Thank you Kim. The Dutch people are so lovely and warm. My sister lived in Holland for many years. ‘Development tsunami’ is the right term. Living in a concrete jungle, I know it best. However, I would still prefer to read and re-read the first part of your post where you describe the arrival of spring. Hope you have warm sunny days ahead! As always, a thoughtful piece with beautiful descriptions! Thank you for this – I feel the same, spring/nature calls to me more than any concrete world might do and your lovely comment has made my day (as well, the sun is shining! )!.